Q: Mix equal parts of Johnny Gimble, Tiny Moore, and Jethro Burns, add a voice like a trombone, and what do you get? A: Seth Rosen, or “SethRo” as he’s known to his bandmates. Mr. Rosen and those bandmates have been busy of late: He plays in two northern Ohio swing bands, the Suspenders and Crazy Rhythm, and both of them released CDs in 2001. 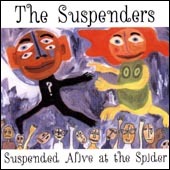 As its title suggests, the Suspenders’ disc, Suspended Alive at the Spider, is a live set recorded at Cleveland’s Barking Spider Tavern. The quintet plays a pleasing mix of traditional swing and jump blues, both on standards/covers and originals by its saxman, “Big Jonny” Abrahamson. Six of the 16 cuts feature SethRo's mandolin, and each one offers some exemplary playing on both lead and rhythm. Seth plays an '87 Flatiron Festival A with a Fishman M100 transducer into a BOSS pre-amp/EQ and a Fender Deville 4x10. His backup playing borders on minimalism: he allows the rhythm section to carry the composition and plays just enough perfectly timed chording to fill out the changes. This works beautifully. On five of these six tunes, no one is playing a guitar! It’s up to Seth to handle the chords and the lead breaks, and he shows exactly what an electric mandolin is capable of. When it comes to taking those breaks, Seth is confident, tight, and melodic without being overly flashy. I particularly like the solos on “Fingers of Just One Hand” and “Walking Shoes.” When he isn’t pickin’ his mandolin on this disc, he’s playing guitar, violin, or bass, or singing. Four of the Suspenders’ members take turns on lead vocals, but I like Seth’s the best. If you can’t afford to attend one of Seth’s swing workshops at the Augusta Heritage Center in West Virginia, buy this disc instead and teach yourself his breaks and rhythm patterns. You’ll be on your way to being a great swing mandolin player.